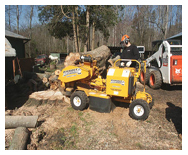 Stump grinding is the most common stump removal service. We have a specialized machine that grinds stumps a few inches below soil surface. This is the equivalent to putting a band aid on the stump. It only grinds the stump low enough for grass to grow over the top and hide it. There will still be some stump below the surface. If you want to replant a new tree, you'll have to move over a couple feet. For replanting in the exact same spot you'll need to completely excavate the stump. For recently planted trees that have died, this is fairly simple and can usually be done by hand. 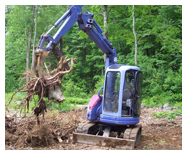 For established, old trees, the stump excavation would require a large piece of equipment such as a back hoe. There is often a significant amount of landscape repair work needed after tree stump excavation. Underground utilities, such as sprinkler pipes, often get broken and the turf usually gets damaged by the equipment. Another option is to use stump rotting agents. You can purchase these products from your local nursery. They are applied by drilling holes in the top of the stump, pouring pellets into the holes and watering it. These stump rotting agents do take a long time to work. It would take the stump 10 years to rot away with an agent as compared to 20 years if left to mother nature. The species of tree will affect the rotting time greatly. You can also leave the stump. Generally, there is no need to remove stumps from the trees' perspective. This is simply a cosmetic procedure.